When Melissa Francis was eight years old, she won the role of lifetime: playing Cassandra Cooper Ingalls, the little girl who was adopted with her brother (played by young Jason Bateman) by the Ingalls family on the world's most famous prime-time soap opera, Little House on the Prairie. Despite her age, she was already a veteran actress, living a charmed life, moving from one Hollywood set to the next. But behind the scenes, her success was fueled by the pride, pressure, and sometimes grinding cruelty of her stage mother. While Melissa thrived under pressure, her older sister - who had tried her hand at acting and shrank from the limelight - was often ignored by their mother in a shadow of neglect and disappointment. Tiffany could do nothing to please her mother, but it wasn't until after Melissa had graduated from Harvard University with a degree in economics, found love, and married that Tiffany's personal problems culminated in a life-and-death crisis. When Melissa realized the role her mother continued to play in her sister's downward spiral, she resolved to end the manic, abusive cycle once and for all. 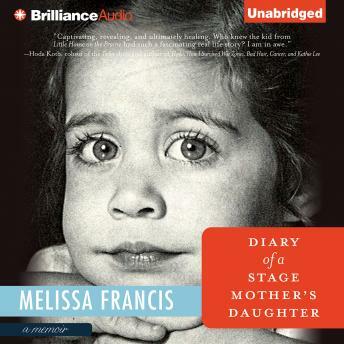 Diary of a Stage Mother's Daughter is a fascinating account of life as a child star in the 1980s, and also a disquieting tale of a family under the care of a highly neurotic, dangerously competitive "tiger mother." But perhaps most importantly, now that Melissa has two sons of her own, it's a meditation on motherhood. She asks the questions so many of us ask ourselves: how hard should you push a child to succeed, and at what point does your help turn into harm?